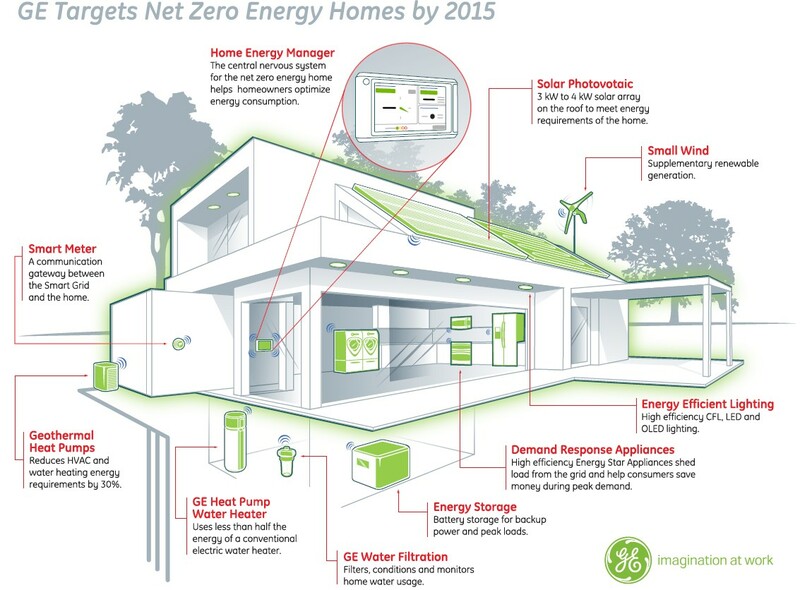 -----image(”GE's Net Zero Energy -　A look at all the GE products and technologies used in GE's Net Zero Energy Home. Home Energy Manager - The central nervous system for the net zero energy home helps homeownares optimize energy consumption. Solar Photovoltaic - 3kw to 4kw solar array on the roof to meet energy requirements of the home. Small Wind - Supplementory renewable generation. Smart Meter - A communication gateway between the Smart Grid and the home. Geothermal Heat Pumps - Reduces HVAC and water heating energy requirements by 30%. GE Heat Pump Water Heater - Uses less than half the energy of a conventional electric water heater. GE Water Filtation - Filters,conditions and monitors home water usage. Energy Storage - Battery storage for backup power and peakloads. Demand Response Appliances - High efficinecy Energy Star Appliances shed load from the grid and help consumers sabe money during peak demand. Energy Efficietn Lighting - High efficiency CFL LED and OLED lighting.
" GE announced today that by 2015 it is developing a turn-key product portfolio that will empower consumers to build, to efficiently consume, manage and generate electricity to enable an overall net zero annual energy cost. GE announced today that by 2015 it is developing a turn-key product portfolio that will empower consumers to build ? both new home builders and existing homeowners ? to efficiently consume, manage and generate electricity to enable an overall net zero annual energy. In addition to GE’s current portfolio of energy-efficient lighting and appliances products and demand response technology that GE is currently developing, GE plans to develop residential power generation products like solar PV and residential wind products, well positioning GE to make the net zero energy home a reality.